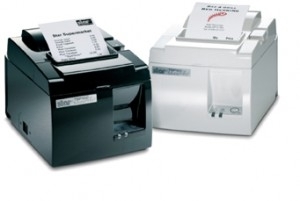 The TSP100 futurePRNT is the first USB only receipt printer on the market today. The power that USB communication interface provides has allowed Star Micronics to build a software driven POS receipt printer that is voucher printing ready – out of the box! The advantages of such a printer are evident for application like retail, restaurants, and convenient stores. It provides an immediate Plug&Play installation which reduces the time of integration to minutes. The TSP100 thermal printer series is provided with all standard operating systems drivers (Windows, Linux and Mac) and specialty drivers like the OPOS and JavaPOS. Also, included in the drivers, Star has included simple utilities that will enhance the Retail or hospitality applications and therefore make the entire experience a charm. Auto-Text Reversal for wall mounted or vertical operation. Simply tick the box and all output will be automatically turned upside down for user comfort. All setting can be stored on the PC and “mirrored” across other TSP100 printers with a simple export configuration feature for mass system installations. No hardwired configuration is needed at all. The TSP100 is provided with a USB connection that provides an immediate “Plug&Play” installation which reduces the time of integration to minutes. 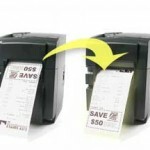 The advantages of such a printer are evident for applications such as retail, restaurants, and convenience stores. The TSP100 direct thermal printer is provided with all standard operating system drivers (Windows™, Linux™ and Mac™) and specialty drivers such as OPOS™ and JPOS™. Star has also included a number of embedded simple utilities that will enhance Retail or Hospitality CRM in POS applications and therefore make the entire experience a charm. The TSP100 futurePRNT Comes Complete! 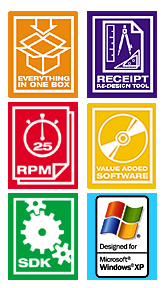 Right out of the box, with free, feature – packed software included on CD! Latest TSP100 Drivers – AVAILABLE HERE!